What an active looking sky. Wonderful night shot! I like the capture of the sky with clouds! Vamos ver como vai ser a primeira noite de Agosto...pela chuva, a 1ª noite não vai ser a melhor. This is a really dramatic night image. 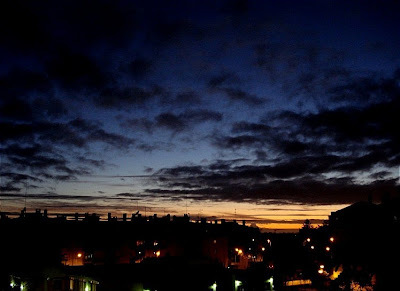 Nice theme day photo of a NIGHT in Portugal! Wonderful photo. I really like the bright gold of the lower sky. Good work. This sky at night is so romantic! Looks like its time to have a drink or two. Great choice for theme day. So great night shot !!! You had a lovely sky for your nightime shot! Only in Summer can you have such a beautiful sky!! Terrific shot...the lights, the sunset, the blue of the sky...perfect! I just love the clouds in this; they add so much to a beautiful night time image. such a beautiful sky. i love nights like this. Great, the sky seems alive! Nice colours, shapes and contrast in light.